Two years ago I looked at Web Collaboration tools. My conclusion was "Close but no cigar." This Lifehacker article prompted me to revisit the topic. Sadly there doesn't seem to be much news here. Track Changes allows you to visibly keep track of each person’s revisions within a document. Added text shows up in a different color for each person who’s made changes. Deleted text also changes color and appears struck through with a line. When it’s time to review the document, you can accept or reject each individual change. Comments annotate a document with notes that don’t really belong in the document text itself. These notes appear in the right margin, are color coded along the same lines as tracked changes, and include the commenter’s initials. When you start collaborating from the desktop, a pop-up notification appears at the bottom of the app to alert you that someone else is editing the document. But in our tests in Word, Excel, and OneNote, several minutes passed before the desktop user received the notification. In some cases, changes to the document were available before we were notified that another person was editing the document. Thinking/hoping that that still wasn't the situation I went to the horse's mouth, Microsoft Office Support. This is a two part blog post. Be sure to read both parts. Well, not exactly geotagging. Finally I found a camera that does a satisfactory job of geotagging on its own. But I'm still into logging my location, particularly on trips. For example on a recent trip to Italy I created several maps (here's one). ...if you have an Android phone? Don't even bother. But I've changed phones since then so I thought I'd give Android another chance. You'll remember that Google "spring cleaned" Google Latitude. But you can still get location history from your Android phone. 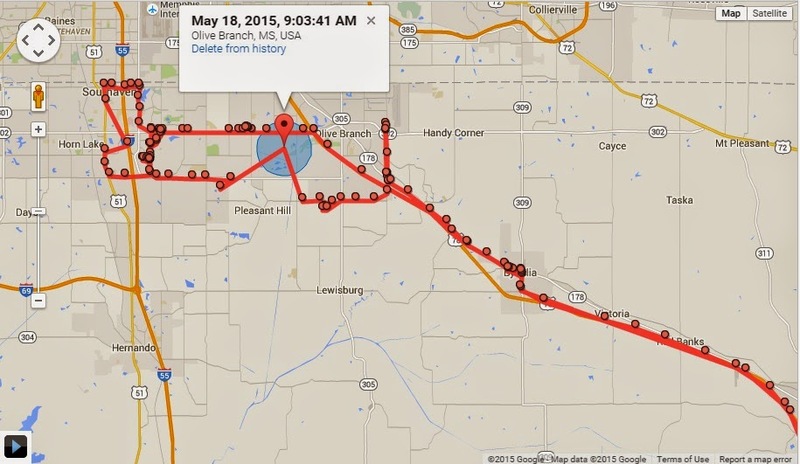 From a geotagging/geotracking perspective that's what you want. So I did an bake-off. I compared Google Now location history to GPSLogger for Android (on my 2013 Moto X) to GPSLogger for Blackberry (on a BlackBerry Bold). This GIF compares the tracks from all 3 tools. There are a couple of conclusions. First Google Now's location history is pretty good. However it seems to have it's own mind about when to take a GPS fix. It increases its frequency when it determines that you're moving and slows down when you stop. But the result is that if when you start moving shortly after a fix it may be 5 minutes or more before it takes another fix. I believe that that results in the odd "jumps" in the Google Now location history. 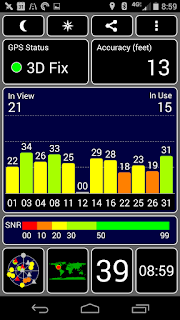 On GPSLogger for Android I have the fix frequency set to one minute. This results in less of those odd "jumps" but they're still there. I have no explanation as to why both Google Now and GPSLogger for Android indicate that I traveled to the I-55/I-69 junction near the bottom left of the map. One can only surmise that the GPS processor in the Moto X is not very good. But I don't think that this is particular to the Moto X. 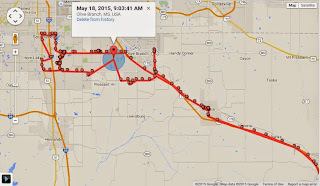 My previous efforts with GPS logging on Android were on Samsung Galaxys and they had the same results. a BlackBerry is a first class method to geotag your photos. For full disclosure I had GPSLogger for BlackBerry set to take a fix every 30 seconds. This is a remnant from my geotagging efforts. I believe for simply recording a track of travels that every 60 seconds is more than sufficient. Obviously this will reduce the battery impact on the BlackBerry. This has continued to bother me. Today when I was driving (actually stopped at a light) I looked at the screen for GPSLogger. It's getting my location from cell towers. Why? GPS Test was getting 21 satellites! 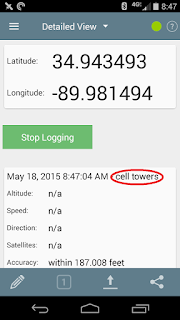 Why wasn't GPSLogger using them? But wait. Read the description for "High accuracy." 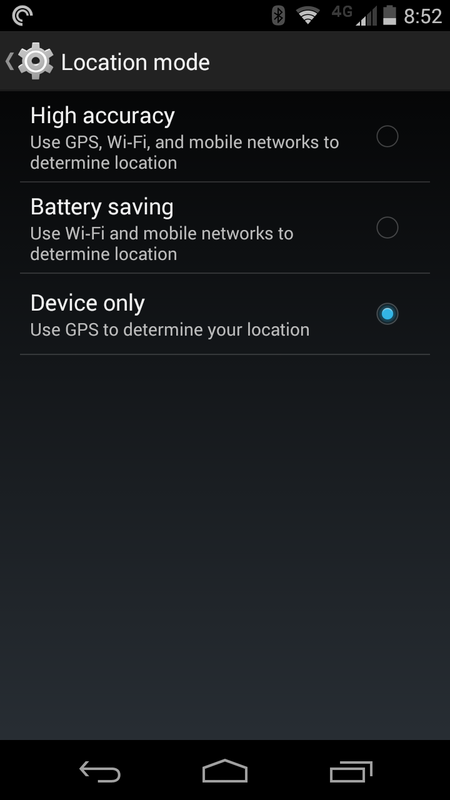 It says "Use GPS, Wi-Fi, and mobile networks to determine location." 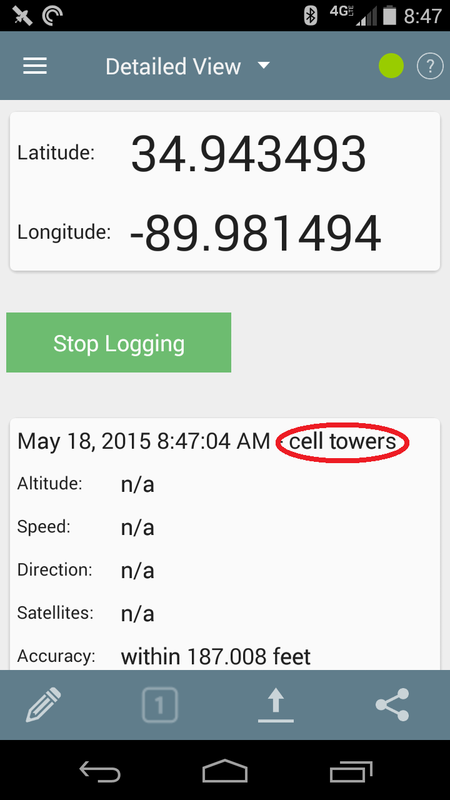 "(M)obile networks" means "cell towers" to GPSLogger. So it looks like "High accuracy" isn't really high accuracy. KitKat seems to be preferring the lower battery impact of cell towers over GPS accuracy. 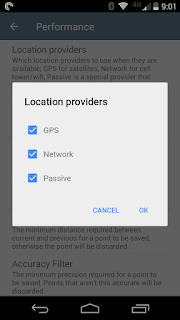 When I set Android's "Location mode" to "Device only" (GPS) look at the result from Google Now. Notice the "jump" that I highlighted at 9:03AM. And there are a couple of similar ones to the left (earlier). The track tightens up after 9:03AM. I turned on "Device only" at 9:06AM. Those "jumps" are apparently the result of using cell towers with improper location signatures. Could that really be it? So I Googled for a while and found this. if i use 'device GPS only' it works fine. widgets and weather data are correct within a few feet. in High Accuracy mode it tends to put me in the wrong place. often another state or country, or it shows my current location as the location of a cell tower (and GNow tells me i'm like 20 mins from home when i'm already there). in this mode, it seems to never use GPS radio at all, relying entirely on wifi and cell towers. this wasn't always part of the location settings, it just showed up with the update. So I went to the GPSLogger web site and found this feature. Then back to GPSLogger and Performance / Location Providers. 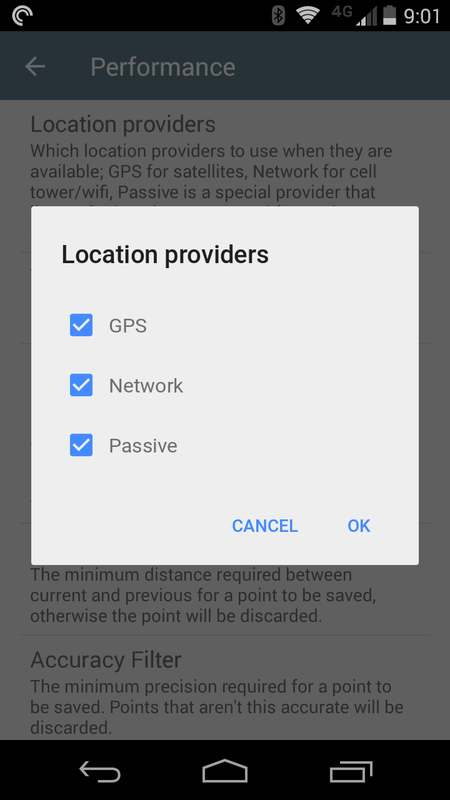 So I unchecked "Network" and "Passive." Now look at the result. I realize that this is a pretty coarse view so here's a zoom in at one location. This seems to have significantly improved Android's GPS tracking. It certainly will have an impact on battery life though. Time will tell. 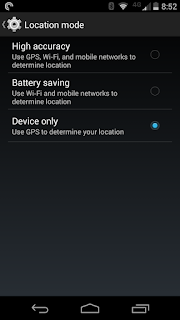 My thinking is to leave Android's "Location mode" to "High accuracy." Generally that works good enough for Google Now's Location History. And I'm going to set GPSLogger Performance / Location Providers to "GPS." That way I'll get more precise logging (and more battery impact) when I want it. Thanks to gifmaker.me for their online animated GIF tool. RAID is good. Right? Keep on reading. First read this article in The Register. tl;dr - "Rebuild times are so long that the chances of an unrecoverable read error (URE) occurring are dangerously high." RAID 5 uses a parity set to recover from a failed drive. The problem is that spinning disks are getting larger. This increases the chance of an unrecoverable read error occurring during the rebuild of a failed drive from the parity set. Your data is gone at that point. Consumer magnetic disk error rate is ... an error every 12.5TB. Now let's look at that for today's big drives. Putting this into rather brutal context, consider the data sheet for the 8TB Archive Drive from Seagate. This has an error rate of 10^14 bits. That is one URE every 12.5TB. That means Seagate will not guarantee that you can fully read the entire drive twice before encountering a URE. How big are the drives in your RAID? Mine are 2TB consumer class. What's a person to do? Enterprise magnetic disk error rate is ... an error every 125TB. That reduces the failure rate by an order of magnitude. The elapsed time of the rebuild is still problematic. Realizing that a Drobo (1st generation) is not an enterprise class RAID system my experience is that the Drobo rebuild time is in excess of 24 hours per TB. Enterprise SSD error rates are ... an error every 12.5PB. That gets you another order of magnitude. But those are expensive. There are alternative RAID modes that give more protection and better recovery time as well. I've recently added Ben Kepes to my reading list. The Forbes web site is awfully heavy with clutter but I let Adblock Plus do its thing. 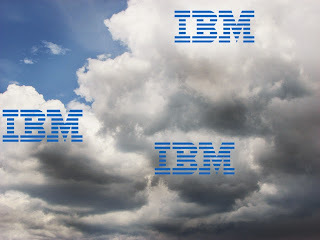 A recent article was about IBM (hence "Big Blue" in the title) and their cloud activities. Ben drug out all the old stories, e.g. Watson winning Jeopardy and "nobody ever got fired for buying IBM" but went on to relate a conversation that he had with Robert LeBlanc, SVP of IBM’s Cloud business. LeBlanc's comments are full of platitudes - "No enterprise is going to lift trillions of dollars of existing assets into the cloud." 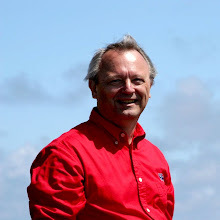 and "New development will happen in the cloud, but existing assets will stay put." Then LeBlanc got into classic IBM speak. Kepes asked him if IBM "would begin to zero rate international traffic." LeBlanc's response was that "high availability is important." Kepes did call out IBM on their continual claims to be the biggest cloud vendor. "I've not seen any independent commentator who gives their claims any real credence." 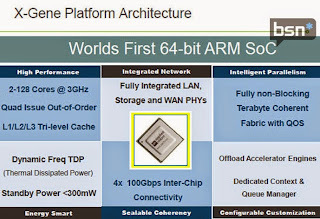 Remember 2 1/2 years ago I posted on the emergence of ARM servers. It's taken a while but they're being adopted by mainstream enterprises. PayPal achieved "... an order of magnitude improvement in compute density"
That's the kind of leap you have to have to displace x86. This reminds me of the transition from mainframes to x86. But remember that RISC systems made a brief appearance during that time. 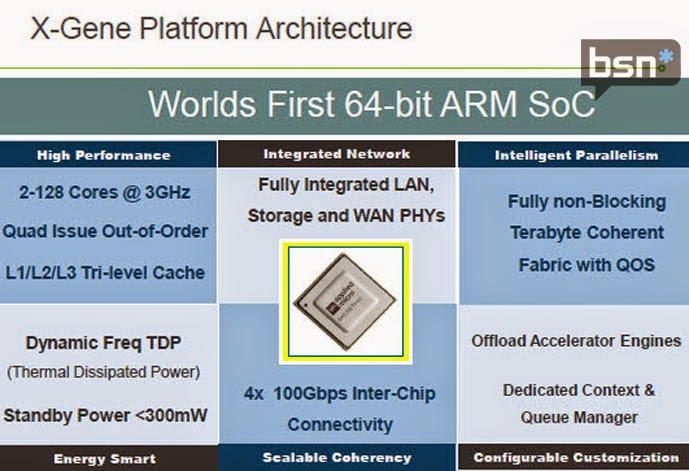 ARM may not be the next big thing. It's going to be interesting over the next couple of years.